Van Nest is a working-class neighborhood geographically located in the East Bronx section of the Bronx, New York City. Going clockwise, its boundaries are Bronxdale Avenue to the northeast, the Amtrak tracks to the southeast, and Bronx Park to the west. Van Nest predated Morris Park by 20 years and is considered the older of the two communities. Morris Park Avenue and White Plains Road are the primary commercial thoroughfares through Van Nest. The neighborhood is part of Bronx Community Board 11, and its ZIP Codes include 10460 and 10462. The area is patrolled by the 49th Precinct of the New York City Police Department. 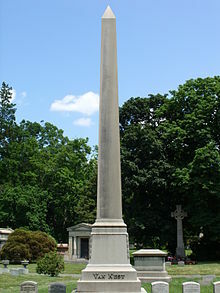 The neighborhood got its name from the former Van Nest station on the New York, New Haven and Hartford Railroad, which was named after the father of Abraham R. Van Nest, a director of the railroad. Van Nest predated Morris Park by 20 years and is considered the older of both communities. A short railroad spur was constructed off the main line from the Van Nest station to serve the adjacent Morris Park Racecourse, which was the site of thoroughbred horse racing from 1889 to 1904. Between 1892 and 1896, lots were subdivided from farmland by the Van Nest Land & Improvement Company. Before the city graded the streets in 1895, the flat terrain and accumulation of rainwater in low-lying areas resulted in this area being nicknamed "Mud West". The multi-legged intersection of Van Nest Avenue, Unionport Road, and Victor Street is still known as the "Five Corners" by many old timers and locals. Van Nest has a population under 15,000. The neighborhood has a concentration of Puerto Ricans and also contains a significant African American population. A small longstanding Italian and Albanian population exist east of White Plains Road near Morris Park. The majority of residents rent. Almost 20% of the population lives below the poverty line. For census purposes, the New York City government classifies Van Nest as part of a larger neighborhood tabulation area called Van Nest/Morris Park/Westchester Square. Based on data from the 2010 United States Census, the population of Van Nest/Morris Park/Westchester Square was 29,250, a change of 2,115 (7.2%) from the 27,135 counted in 2000. Covering an area of 829.61 acres (335.73 ha), the neighborhood had a population density of 35.3 inhabitants per acre (22,600/sq mi; 8,700/km2). The racial makeup of the neighborhood was 27.3% (7,987) White, 11.1% (3,245) African American, 0.3% (82) Native American, 10.6% (3,100) Asian, 0.1% (15) Pacific Islander, 1% (292) from other races, and 1.4% (410) from two or more races. Hispanic or Latino of any race were 48.3% (14,119) of the population. Van Nest is dominated by single family homes of various types. There are also some tenements scattered across the neighborhood. The total land area is roughly one square mile. Architectural styles are diverse in Van Nest, which was started as a residential community in 1893. Italianate, Queen Anne, Art Deco and contemporary brick and mortar are all found. Con Edison's Van Nest Service Center is located north of the Amtrak Northeast Corridor line between Unionport Road and Bronxdale Avenue, occupying the former maintenance shops of the New York, New Haven and Hartford Railroad. The Con Edison Service Center was purchased in September 1959 from the New York, New Haven and Hartford Railroad for $3 million. The former Van Nest Yards were built in 1907 and the Yards, now Con Edison Service Center consists of 940,000 square feet (87,000 m2). Van Nest Park is bound by White Plains Road to the east, Unionport Road to the west, and Van Nest Avenue to the north. Mead Street bisects Van Nest Park from Van Nest Memorial Square, which houses the war memorial. Van Nest Park was acquired by New York City in August 1913, the present location of Van Nest Memorial Square. In April 1922, the land was placed under Parks' jurisdiction. 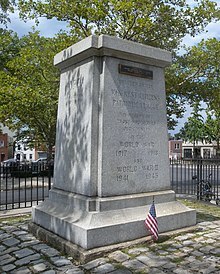 The monument, which stands at the center of the original park, was erected in April 1926 by the Van Nest Citizens' Patriotic League, who were, at one time, located at 1800 Hunt Avenue. The monument is made of Deere Isle granite and was designed by architect Arthur G. Waldreaon. The park, like the neighborhood, was named after Reynier Van Nest, a saddle maker. In 1997, Mayor Rudy Giuliani funded a $30,000 renovation of the park replacing the old playground equipment. Dialogue concerning the renovation of the park was started in 2010. However, as of May 2011, $950,000 had been allocated for renovations to the playground. Construction of the park was started in March 2014 and lasted for a year. The renovated park's railroad theme is based on the neighborhood's long-standing ties to the Van Nest station along the Northeast Corridor. Additionally, security cameras were installed through a contribution from Cross-County Federal Bank to monitor night time activity in the park. State Senator Jeffrey D. Klein was instrumental in securing the proper permits for the cameras. Van Nest Park, after being completely renovated, was officially opened to the public in May 2015. The 49th Precinct has a lower crime rate than in the 1990s, with crimes across all categories having decreased by 80.6% between 1990 and 2018. The precinct saw 7 murders, 25 rapes, 176 robberies, 307 felony assaults, 171 burglaries, 439 grand larcenies, and 95 grand larcenies auto in 2018. Van Nest contains one of the highest concentrations of poverty in Bronx Community District 11. It is believed many of the newest residents are from higher poverty sections of the Bronx such as neighboring West Farms and Parkchester. With this relocation some of the social problems commonly associated with those communities have come to Van Nest. Drug trafficking, teen pregnancy, domestic violence and violent crimes, including gang activity, are common. Van Nest, being roughly one square mile, is one neighborhood within the larger 49th Precinct. In January 2010, a community organization known as the Van Nest Neighborhood Alliance (VNNA) was created, which meets monthly. Their agenda is to work jointly with the 49th Precinct to ensure that any reported crimes are handled quickly and follow-up conducted thoroughly. Additionally, aside from merely reporting and following up with crimes, both the 49th Precinct and the VNNA are trying to direct the youth into precinct sponsored programs such as kids and cops basketball and Explorers. The rise in youth-related crimes is a genuine concern for the VNNA and the local 49th police precinct. Van Nest is served by the New York City Fire Department (FDNY)'s Engine Co. 90/Ladder Co. 41 fire station at 1843 White Plains Road. Ladder Co. 41, also known as the Van Nest Hose Company originally started out as volunteer company and was known as Van Nest Hose Co. No. 1. They were originally located at 1703 Unionport Road and were organized in 1906. Additionally, Van Nest Hose Co. No. 2 was located at East Tremont and Rosedale Avenues and disbanded in 1910, the same year as Hose Co. No. 1. When the Van Nest Hose Co. 1 made the move to White Plains Road in May 1910 they became a paid company. In May 2010, Engine Co. 90/Ladder Co. 41 celebrated its 100th anniversary. The area around White Plains Road where the firehouse is located was blocked off for the celebration. In attendance were 147 alumni from the firehouse, FDNY Fire Commissioner Salvatore Cassano and an additional 153 guests. The final part of the ceremony was the unveiling of a plaque to commemorate the 100 years of dedicated service in addition to an existing plaque that was originally placed inside the firehouse in 1910 when it opened. A few members of Engine Co. 90 have also served in the U.S. military. Van Nest is located within ZIP Codes 10460 west of Unionport Road and 10462 east of Unionport Road. The United States Postal Service operates the Parkway Station post office at 2100 White Plains Road. Van Nest and Allerton generally have a lower rate of college-educated residents than the rest of the city. While 32% of residents age 25 and older have a college education or higher, 24% have less than a high school education and 44% are high school graduates or have some college education. By contrast, 26% of Bronx residents and 43% of city residents have a college education or higher. :6 The percentage of Van Nest and Allerton students excelling in math rose from 32% in 2000 to 48% in 2011, though reading achievement remained constant at 37% during the same time period. Van Nest once had two Catholic grammar schools: St. Dominic's at 1684 White Plains Road and Our Lady of Solace at the intersection of Holland and Morris Park Avenues. Both schools had grades K–8. However, by 2006, Our Lady of Solace had closed its doors due to budget cuts within the New York Catholic Archdiocese. Our Lady of Solace school building remained vacant until September 2010, when the Bronx Charter School of Excellence annex opened; the school's main site is at Benedict Avenue, while the Holland Avenue site serves as only an annex for grades five and six. The School of Excellence began leasing the Solace building in August 2010, and had made $400,000 worth of renovations from electric wiring, plumbing, and exterior masonry work. The School of Excellence plans to expand to grades fifth through eighth within the next two years. 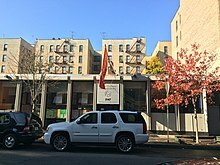 The New York Archdiocese announced in January 2011 that St. Dominic's, along with four other Bronx grammar schools, would be closing by the end of the school year in June. St. Dominic's grammar school, founded in 1952, had approximately 200 students, who needed to transfer to other schools in the area. Some of the staff members, especially the nuns will be transferring to St. Raymond's school which is located in Parkchester. Prior to its closing in the end of June 2011, a farewell Mass was held to commemorate the school's 59-year history. As of September 2015, the former St. Dominic's Catholic elementary school will be opened up as Public School 481, a school with grades K–5. The New York Public Library (NYPL)'s Pelham Parkway-Van Nest branch is located at 2147 Barnes Avenue. The branch opened in 1912 as one of NYPL's "Travelling Libraries", and between 1917 and 1968, moved to a series of permanent locations. The current building, which opened in 1968, has been known as the Van Nest or Van Nest Pelham branch through its history. 7th Day Adventist Church is located at 800 Morris Park Avenue. Episcopalian, St. Martha's is located at 1858 Hunt Avenue. Lutheran, St.Luke's is located at 1722 Adams Street. Pentecostal, Van Nest Assembly of God is located at 755 Rhinelander Avenue. There was as well a significant Jewish population in the later part of the 19th and early part of the 20th century in Van Nest. The synagogue located at 1712 Garfield Street was built in 1905. The B'nai Jacob First Van Nest Hebrew Congregation was established in 1895 and by the early 1920s had upwards of 50 families, a religious school within the synagogue to accommodate 80 pupils, and services in Hebrew, Yiddish, and English. 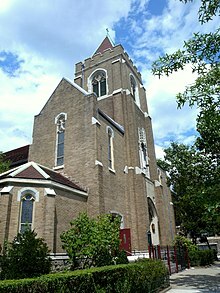 By January 1979, the First Van Nest Hebrew Congregation had disbanded and sold the property and building to the Mission Christiana Rehoboth church. The New York City Subway's IRT White Plains Road Line (2 and ​5 trains) operates along Birchall Avenue and has a stop at the Bronx Park East station. The IRT Dyre Avenue Line (5 train) occupies the old right of way of the New York, Westchester and Boston Railway (NYW&B). The East 180th Street station on the IRT White Plains Road Line, built in 1912, was once the Administration Building for the NYW&B. 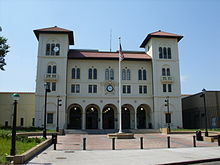 The station was designed by Stem, Allen H., Fellheimer & Long, in a style reminiscent of late 19th and early 20th century revivals. It was placed on the National Register of Historic Places on April 23, 1980. From 2010 to 2013, the station underwent a major rehabilitation. The NYPD's Transit District #12 resides directly across the street from the East 180th Street station at 460 Morris Park Avenue. The Amtrak's Northeast Corridor is used by trains traveling to and from Penn Station via the Hell Gate Bridge, and connects with Metro-North's New Haven Line near New Rochelle station in Westchester. However, the Metropolitan Transportation Authority (MTA) has proposed Penn Station Access, which could possibly bring Metro-North Railroad's New Haven service along the Hell Gate Line. Four possible new stations include Hunts Point, Parkchester-Van Nest, Morris Park, and Co-Op City. If built, the Parkchester-Van Nest station may occupy the footprint of the former Van Nest station. Conti's Bakery was established on October 1, 1921 on Victor Street and eventually relocated to 786 Morris Park Avenue in 1928. Purchased in 2003 by Sal Paljevic from the original owners, it went through a four-week renovation in February 2007 to restore its tin ceiling and wood panel walls. Other antique features include an original marble countertop, collection of black-and-white photographs and vintage tin advertisements. In the summer of 2005, the exterior of the bakery was renovated to include a retractable, old-fashioned awning and traditional display windows. Conti's Bakery is known for its legendary Boston cream pie. Riviera Ravioli, another famous Van Nest institution. is located at 643 Morris Park Avenue. It started out as a deli back in 1946 and eventually moved to its present location in 1976. Riviera features a wide variety of not only ravioli but specialty filled raviolis such as lobster, crab and walnut. Other types of pasta include: tortellini, cavatelli, manicotti, and fettuccini. According to its owner, Joseph Giordano the name Riviera Ravioli has its origins from the Italian Riviera which is located in the northwest portion of Italy. Giordano's descendents are from that area specifically. Riviera Ravioli has closed as of August 2014. The Morris Park Boxing Club located at 644 Morris Park Avenue was started back in 1978 by Joe DeGuardia Sr. Joe DeGuardia, the founder's son presently owns the club. Dex Pejcinovic, a former club member and fighter oversees the daily operations. The club had a setback in December 2009 with an electrical fire which displaced members of the club and residents living in the apartments above the club. Some notable fighters to come out of the Morris Park Boxing Club include WBA world champions welterweight Aaron Davis and light heavyweight Lou Del Valle. Stokely Carmichael (1941-1998), a 1960s civil rights activist, moved to Van Nest in 1952 from Harlem when he was 11. Carmichael along with his father Adolphus and mother Mabel resided at 1810 Amethyst Street. General James F. Collins (1905–1989), a four-star general, moved to 1820 Unionport Road from Manhattan in 1909. He attended P.S. 34 from 1911 to 1919, and then Regis High School; afterward, he was appointed to the United States Military Academy at West Point. General William Fiorentino was born on January 2, 1935 and resided at 1842 Hunt Avenue in his younger years. He graduated from P.S. 34 and Cardinal Hayes High School. He attended Fordham University and graduated with a degree in physics. Kenneth E. Gazzola, who lived on Matthews Avenue, is an aviation professional and President and CEO of FlightLogix and Board Member of The Wings Club, an aviation society. He is also a board member of the Smithsonian's National Air and Space Museum. Carl Paul Jennewein (1890-1978), an artist and sculptor, had his studio at 538 Van Nest Avenue from 1928 until his death in 1978. On June 2, 2011, the section of Van Nest Avenue between Melville Street and Van Buren Street was renamed Carl Paul Jennewein Place in honor of the sculptor. Roland La Starza (1927-2009), a boxer, was born May 12, 1927 and lived on Van Nest Avenue near Van Buren Street. He attended Columbus High School, then went to City College when his boxing career took off. Cardinal Edwin F. O'Brien was born in Van Nest. His Irish Catholic family lived in a two-bedroom apartment in Van Nest. He is pro-grand master of the Equestrian Order of the Holy Sepulcher of Jerusalem; the pope's representative to Catholics in the Holy Land; and the chief fund raiser for the preservation of that region's sacred sites. He was ordained in 1965 by Cardinal Francis Spellman and assigned to West Point. Prior to his present position, he was Archbishop of Baltimore. Since May 1997, O'Brien has been returning to his boyhood parish of Our Lady of Solace to perform the sacrement of confirmation. Eugene D. Orza went to St. Dominic's elementary school and was once the general counsel of the Major League Baseball Players' Association. He graduated from St. John's University School of Law. Regis Philbin, a television personality, attended Our Lady of Solace School on Morris Park and Holland Avenues. A block of Cruger Avenue, where he lived, was renamed in his honor. In January 2010, his boyhood home at 1990 Cruger Avenue was demolished. Michael Sardo, a Hollywood writer and executive producer, grew up in Van Nest. He has written for many television series, such as Caroline in the City, Wings, and Fairly Legal. John Patrick Shanley, a playwright and screenwriter, grew up in Van Nest. He wrote the script for the 1987 film Five Corners, which was set in the east Bronx and took its name from an intersection in Van Nest. ^ a b "Van Nest neighborhood in New York". Retrieved September 28, 2015. ^ Bleyer, Jennifer (December 30, 2007). "Another Little Italy, With Scant Parking to Match". The New York Times. Retrieved August 23, 2009. ^ "Historic Map Shows the Boundaries of 54 Neighborhoods in the Bronx". The New York Times. September 9, 1964. Retrieved March 13, 2016. ^ "Van Nest Property Sold; Good Prices For Lots Opposite Morris Park Entrance". The New York Times. May 23, 1893. Retrieved August 18, 2010. ^ a b "NYPD – 49th Precinct". www.nyc.gov. New York City Police Department. Retrieved October 3, 2016. ^ Hughes, C.J. (April 21, 2011). "People Care, and It's Starting to Show". The New York Times. Retrieved March 1, 2014. ^ McNamara, John (1993). 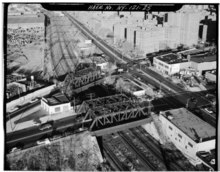 History in Asphalt: The Origin of Bronx Street and Place Names. Bronx County Historical Society. p. 204. ISBN 0-941980-16-2. ^ a b "The Many Names of Van Nest". Bronx River Alliance. Retrieved August 23, 2009. ^ "Bronx Community District 11" (PDF). New York City Department of City Planning. December 2008. Archived from the original (PDF) on March 20, 2009. Retrieved October 15, 2009. ^ a b c d e f g h i j k l m n o "Morris Park and Bronxdale (Including Allerton, Bronxdale, Indian Village, Morris Park, Pelham Gardens, Pelham Parkway and Van Nest)" (PDF). nyc.gov. NYC Health. 2018. Retrieved March 2, 2019. ^ "NYC-Bronx Community District 11--Pelham Parkway, Morris Park & Laconia PUMA, NY". Retrieved July 17, 2018. ^ "Con Ed Buys Shops of New Haven Here". The New York Times. September 24, 1959. p. 57. Retrieved September 2, 2009. ^ a b "Van Nest Park". New York City Department of Parks and Recreation. Retrieved September 24, 2010. ^ Williams, Jaime (November 14, 2014). "East Bronx History Forum and Van Nest Neighborhood Association host Veterans Day Ceremony". Bronx Times Reporter. p. 30. Retrieved November 20, 2014. ^ "Veterans honored at Van Nest war memorial". News 12 The Bronx. Retrieved November 12, 2014. ^ Rocchio, Patrick (November 22, 2017). "Van Nest Monument rebuild slated for spring 2018". Bronx Times Reporter. Retrieved November 26, 2017. ^ "Van Nest war memorial to get facelift". Joanna Hernandez News 12 The Bronx. Retrieved November 19, 2016. ^ "Renovations coming to Bronx veterans memorial". Carmen Grant. Retrieved November 26, 2017. ^ Marinaccio, Amanda (January 7, 2010). "Thumbs up for Van Nest Park expansion". New York Post. Retrieved February 29, 2016. ^ Signorile, Vito (May 31, 2011). "VN Park Receives More Funding For Future Renovations". Bronx Times-Reporter. p. 55. Retrieved June 14, 2011. ^ "Train-themed playground planned for new Van Nest park". Retrieved March 6, 2014. ^ a b Williams, Jaime (May 15, 2015). "Train theme for new Van Nest Park". Bronx Times Reporter. p. 6. Retrieved May 23, 2015. ^ Signorile, Vito (September 30, 2011). "Van Nest Park Receives Security Cameras". Bronx Times-Reporter. p. 5. Retrieved October 2, 2011. ^ Klein, Jeffrey (September 16, 2011). "Senator Klein, Community, Announce New Security Cameras At Van Nest Park". New York State Senator Jeffrey D. Klein. Retrieved October 2, 2011. ^ "Renovated Van Nest playground offers safety for kids, parents". Retrieved May 9, 2015. ^ "Van Nest Park - Bronx, NY - Visit a Playground - Landscape Structures". Retrieved November 15, 2015. ^ "Pelham Parkway: Baychester, Westchester Square – DNAinfo.com Crime and Safety Report". www.dnainfo.com. Retrieved October 6, 2016. ^ "49th Precinct CompStat Report" (PDF). www.nyc.gov. New York City Police Department. Retrieved July 22, 2018. ^ "CompStat". New York City police Department. Retrieved June 18, 2016. ^ Marinaccio, Amanda (February 17, 2010). "Van Nest Neighborhood Alliance elects board". Bronx Times-Reporter. p. 27. Retrieved July 24, 2011. ^ Rocchio, Patrick (January 25, 2011). "Police to meet with Van Nest community to address youth crime". Bronx Times Reporter. p. 6. Retrieved November 14, 2011. ^ "Engine Company 90/Ladder Company 41". FDNYtrucks.com. Retrieved March 14, 2019. ^ "Valiant "Vamps", Bronx Fire Fighters, Soon to Hear "Taps"" (PDF). The Evening Telegram. April 19, 1910. p. 10. Retrieved January 19, 2015. ^ "Mike Boucher's F.D.N.Y. History Page" (PDF). The Unofficial Homepage of the FDNY. Retrieved October 18, 2010. ^ McNamara, John (1989). McNamara's Old Bronx. The Bronx County Historical Society. p. 208. ISBN 0-941980-25-1. ^ Roberts, Daniel (May 16, 2010). "Morris Park firehouse celebrates centennial". The Bronx Times Reporter. Retrieved January 22, 2011. ^ Samuels, Tanyanika (March 21, 2013). "Local Iraq veterans reflect on the war as the country marks the 10th anniversary of the invasion". New York Daily News. Retrieved January 19, 2015. ^ "Morris Park, New York City-Bronx, New York Zip Code Boundary Map (NY)". United States Zip Code Boundary Map (USA). Retrieved March 17, 2019. ^ "Location Details: Parkway". USPS.com. Retrieved March 7, 2019. ^ "Morris Park / Bronxdale – BX 11" (PDF). Furman Center for Real Estate and Urban Policy. 2011. Retrieved October 5, 2016. ^ Mitchell, Max (September 30, 2010). "Charter school opens in old Our Lady of Solace building". The Bronx Times Reporter. p. 27. Retrieved January 17, 2012. ^ Lestch, Corinne (January 12, 2011). "Archdiocese to close 27 Catholic schools, including 6 in the Bronx, 3 in Manhattan 4 in S.I." Daily News. New York. p. 18. Retrieved January 12, 2011. ^ Mitchell, Max (January 13, 2011). "Archdiocese announces closure of St. Dominic school". Bronx Times Reporter. p. 1. Retrieved January 16, 2011. ^ O'Shaughnessy, Patrice (June 23, 2011). "Treatment of Catholic parish schools as real estate results in shuttered schools". Daily News. New York. p. 36. Retrieved June 23, 2011. ^ Lestch, Corinne (July 1, 2011). "St. Dominic school staff and students bid farewell to Bronx parish school". Daily News. New York. p. 42. Retrieved July 2, 2011. ^ Williams, Jaime (October 24, 2014). "Van Nest, Wakefield to get new elementary schools". Bronx Times Reporter. p. 8. Retrieved November 30, 2014. ^ Williams, Jaime (November 25, 2014). "St. Dominic school building to open as choice public school". Bronx Times Reporter. p. 26. Retrieved November 30, 2014. ^ "About the Pelham Parkway-Van Nest Library". The New York Public Library. Retrieved March 14, 2019. ^ "Cardinal Dedicates New Church in Bronx". The New York Times. May 9, 1927. p. 24. Retrieved August 26, 2009. ^ "Parish of Our Lady of Solace - Saint Dominic". Our Lady of Solace. Retrieved March 12, 2016. ^ "Morris Park Seventh-day Adventist Church". Seventh Day Adventist Church. Retrieved February 27, 2016. ^ "St. Martha's Episcopal Church, Bronx, NY". The Episcopal Church. Retrieved February 27, 2016. ^ "Van Nest Assembly of God A House of Prayer for all Nations". Van Nest Assembly of God. Retrieved March 25, 2016. ^ Schneiderman, Harry (1920). The American Jewish Year Book 5680. 21. Philadelphia: The Jewish Publication Society of America. p. 461. Retrieved July 27, 2010. ^ "New York City Department of Finance: Office of the City Register". NYC.gov. Retrieved September 18, 2010. ^ "State Listings New York". National Register of Historic Places. Retrieved August 18, 2010. ^ Mitchell, Max (August 25, 2010). "Station rehab may bring in new stores". Bronx-Times Reporter. p. 8. Retrieved February 9, 2011. ^ Dunlap, David W. (January 31, 2013). "100 Years Later, a Railroad Landmark Is Revived". The New York Times. Retrieved March 11, 2013. ^ "Transit Bureau". New York City Police Department. June 18, 2016. Retrieved June 18, 2016. ^ Rocchio, Patrick (November 10, 2011). "MTA may build four new Metro-North stations". Bronx Times Reporter. p. 1. Retrieved November 20, 2011. ^ Beekman, Daniel (December 28, 2011). "New passenger rail service for the East Bronx gaining steam with the MTA bigwigs and boro leaders all aboard". New York Daily News. p. 29. Retrieved December 29, 2011. ^ Clarke, Erin. "Bronx Neighbors Wants Future Metro-North Stop Named After Area's Distant Past". New York 1 News. Retrieved February 16, 2016. ^ "Conti's Pastry Shoppe celebrates 95th birthday". Gianna Gelosi News 12 The Bronx. Retrieved June 5, 2016. ^ Signorile, Vito (December 7, 2011). "After 90 years, Conti's Pastry Shoppe better than ever". Bronx Times Reporter. p. 15. Retrieved December 20, 2011. ^ Collazi, Bret Nolan (March 1, 2007). "Conti's renovation unveils past splendor, adds modern cafe". Bronx-Times Reporter. p. 10. Retrieved February 9, 2011. ^ "Customers swarm Bronx bakeries before Christmas". Tony Chau News 12 The Bronx. Retrieved December 28, 2015. ^ "Bronx Week: Local Factory Makes Ravioli Packed With Italian Flavor". New York 1 News. Retrieved August 31, 2010. ^ Rocchio, Patrick (March 18, 2016). "Boxing trainer, youth advocate and Morris Park legend Joseph DeGuardia Sr. mourned". Bronx-Times Reporter. New York. Retrieved March 25, 2016. ^ Blau, Reuven (March 10, 2016). "Bronx boxer Joe DeGuardia dies at age 86, trained thousands of young fighters". New York Daily News. New York. Retrieved March 26, 2016. ^ "Bronx boxing legend Joe DeGuardia dies". News 12 The Bronx. Retrieved March 26, 2016. ^ Gonzalez, David (December 23, 2009). "Down, Not Out, After a Fire Guts a Gym in the Bronx". New York Times. New York. Retrieved March 26, 2016. ^ Beekman, Daniel (December 22, 2010). "Fire-ravaged gym gets off deck, welcomes fighters back". Daily News. New York. p. 36. Retrieved December 31, 2010. ^ Carmichael, Stokely (2005). Ready for Revolution: The Life and Struggles of Stokely Carmichael (Kwame Ture). Scribner. ISBN 9780684850047. ^ McNamara, John (1989). McNamara's Old Bronx. The Bronx County Historical Society. p. 214. ISBN 0-941980-25-1. ^ Twomey, Bill (February 29, 2012). "Do You Remember? General Fiorentino, Brigadier General, Van Nest". Bronx-Times Reporter. p. 39. ^ "Board of Governors". Wings Club. Retrieved August 13, 2015. ^ "Staff". FlightLogix. Retrieved August 13, 2015. ^ "Donors Kenneth and Madge Gazzola and Harrison Ford". Eric Long. Retrieved August 13, 2015. ^ Koyl, George S., ed. (1962). American Architects Directory (2nd ed.). New York: R.R.Bowker Company. p. xxiii. Retrieved January 16, 2010. ^ Samuels, Tanyanika (June 2, 2011). "Bronx street rename for borough's own sculptor Carl Paul Jennewein". New York Daily News. New York. p. 31. Retrieved June 5, 2011. ^ Signorile, Vito (June 16, 2011). "Van Nest Artist Honored With Street Rename". Bronx Times Reporter. Retrieved June 16, 2011. ^ Signorile, Vito (June 10, 2011). "Van Nest Artist Honored With Street Rename". The New York Post. Retrieved July 6, 2014. ^ Twomey, Bill (June 14, 2007). "Do You Remember? Roland LaStarza, boxer and actor". Bronx-Times Reporter. p. 40. ^ Berger, Joseph (January 7, 2012). "Another Step Up for a Bronx Native Who Led the Archdiocese in Baltimore". New York Times. Retrieved January 7, 2012. ^ Beekman, Daniel (January 7, 2012). "Bronx native Edwin O'Brien is among the 22 Catholic clergyman appointed cardinals by the Pope". New York Daily News. Retrieved January 7, 2012. ^ Rocchio, Patrick (January 10, 2012). "Former Van Nester elevated to Cardinal". Bronx Times Reporter. p. 1. Retrieved January 17, 2012. ^ "OK, not much..." Michael Fornabaio. Retrieved August 2, 2012. ^ "Eugene D. Orza '73". St. John's University. Retrieved March 1, 2014. ^ "Who Wants to Be On a Street Sign?". Forgotten New York. Retrieved August 23, 2009. ^ "Michael Sardo". The Internet Movie Database. Retrieved January 20, 2011. ^ "Fairly Legal: On the Scene". Hulu. Retrieved February 6, 2011. McNamara, John (1991). History In Asphalt: The Origin Of Bronx Street And Place Names. Bronx, New York: The Bronx County Historical Society. ISBN 0-941980-16-2. McNamara, John (1989). McNamara's Old Bronx. Bronx, New York: The Bronx County Historical Society. ISBN 0-941980-25-1. Wikimedia Commons has media related to Van Nest, Bronx. This page was last edited on 3 April 2019, at 01:36 (UTC).